Venezuela has expelled five visiting European lawmakers, an act opposition leader Juan Guaido branded "irrational" as his showdown with President Nicolas Maduro over the arrival of international aid intensifies. The members of the European Parliament were being tossed out with no explanation, said Spanish MEP Esteban Gonzalez Pons, who led the group. "We are being expelled from Venezuela. Our passports have been seized. They have not informed us of the reason for the expulsion," Pons said. The incident on Sunday is the latest point of tension between the international community and Maduro, who is in the grip of a power struggle with Guaido, the head of the National Assembly who proclaimed himself interim president last month. Guaido has the backing of more than 50 countries including 30 in Europe. Pons' fellow Spaniards Jose Ignacio Salafranca and Gabriel Mato Adrover, as well as Esther de Lange of the Netherlands and Paulo Rangel of Portugal, were also expelled. All are members of the conservative European People's Party (PPE). Writing on Twitter, Guaido said the MEPs were being "deported by an isolated and increasingly irrational regime." Foreign Minister Jorge Arreaza said the Europeans had "conspiratorial aims" and were sent back from the country's main Maiquetia airport. Earlier Sunday Guaido set a goal of enlisting a million volunteers within a week to confront a government blockade that has kept tons of humanitarian aid, most of it from the United States, from flowing into the country where residents can't get enough food and say they are dying because of a shortage of medicines. Guaido has given next Saturday -- one month to the day after he proclaimed himself acting president -- as the date for a showdown with Maduro over the aid. Food supplies, hygiene kits and nutritional supplements have been stockpiled near the Venezuelan border in Cucuta, Colombia. Additional storage centers are supposed to open this week in Brazil and Curacao, a Dutch island off Venezuela's northern Caribbean coast. "Our principal task is to reach a million volunteers by February 23," Guaido said in a message to the 600,000 supporters who have signed up so far for the push to bring aid in. Caravans of buses are being planned to carry volunteers to border entry points to meet and transport arriving cargo. Guaido has kept to himself how he plans to overcome the border barriers put up by the Venezuelan military, on Maduro's orders. 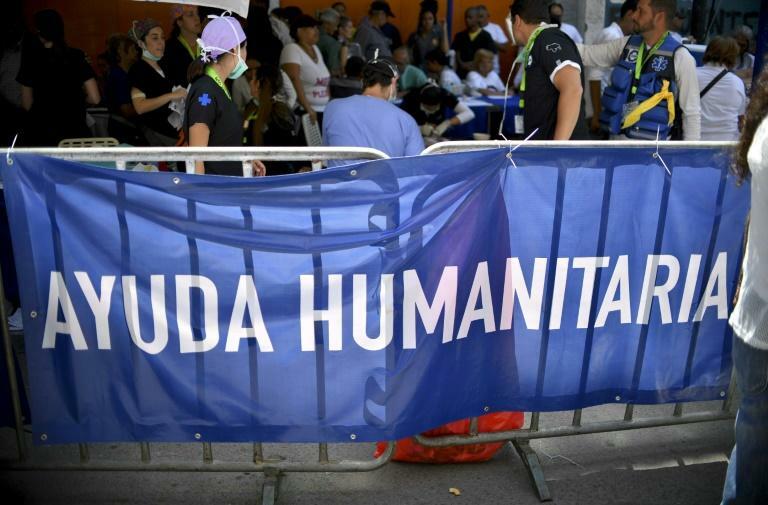 Volunteer groups have begun meeting in "humanitarian camps" in several Venezuelan states to organize and prepare for the aid arrival. They have started to identify the most vulnerable and have begun caring for the needy in accordance with Guaido's promises. Sometimes working under awnings or tents, doctors, nurses, dentists and pediatricians have attended to local residents who can receive donated medications. Patients arrive with respiratory, skin or other ailments, and suffering from malnutrition. An imploding economy has driven an estimated 2.3 million Venezuelans to migrate from the oil-rich country. Those who remain have been punished by hyperinflation that has put scarce food and medicine out of reach for many. Andrea Hernandez, a physical therapy student whose mother is a pediatric nurse, is among those offering her help. Hernandez said her mother often "cried from seeing her patients die from lack of medicine." Yorger Maita, a helper from the aid group Rescate Venezuela, said that if foreign aid doesn't enter "other people will continue to die." "Venezuela is preparing for the humanitarian avalanche," Guaido told about 4,000 supporters clad in white T-shirts and green scarves who gathered Saturday to sign up as volunteers. 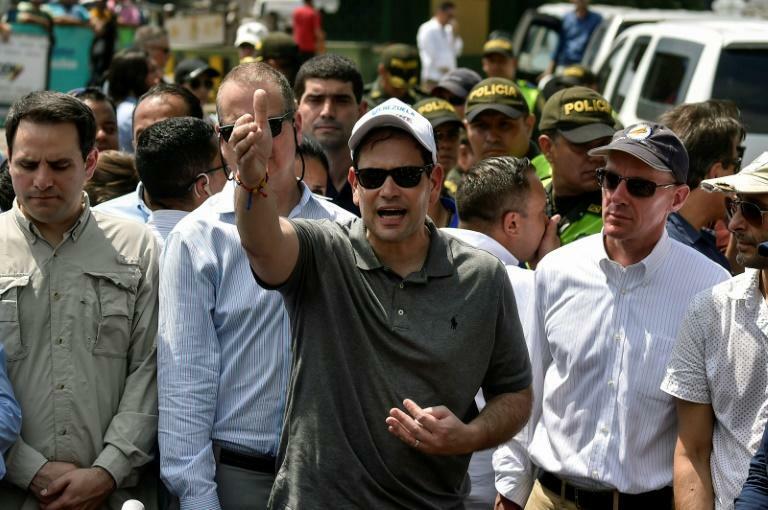 US Senator Marco Rubio arrived Sunday in Cucuta for a first-hand look at the aid operations. "Whoever prevents the entry of humanitarian aid is condemned to spend the rest of their lives fleeing international justice, because that is an international crime," Rubio said in Spanish. 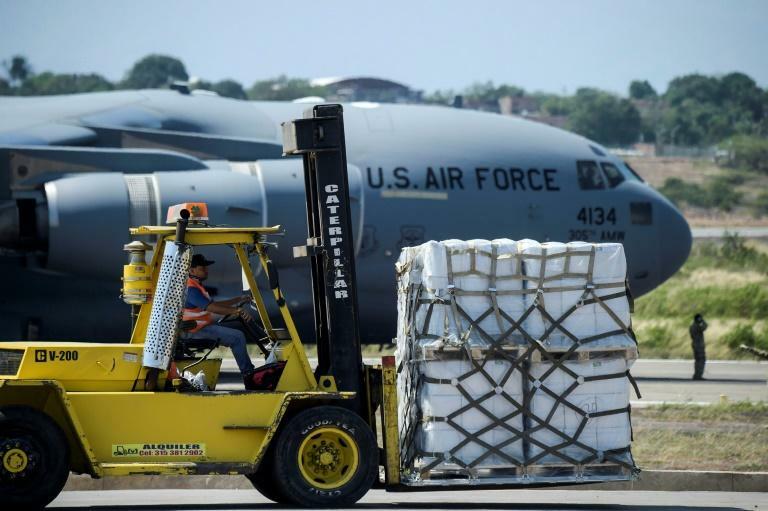 Three US military cargo planes delivered several dozen more tons (tonnes) of food assistance to Cucuta on Saturday. Another US aircraft is due in Curacao from Miami on Tuesday, and a collection center for Brazilian aid will open Monday on the border, Guaido's team said. Venezuelans based in Miami held their own drive, putting together 1,000 crates of food to send to their homeland. On Friday, Maduro instructed his army to prepare a "special deployment plan" for the 2,200-kilometer (1,370-mile) border with Colombia. Guaido appealed for the military to let the aid pass. Maduro has dismissed the humanitarian assistance as "crumbs" and "rotten and contaminated food" while blaming shortages of food and medicine on US sanctions. For analyst Benigno Alarcon, "as the regime closes the door on humanitarian aid, it closes it to a peaceful solution to the political situation in the country." Guaido announced that British billionaire Richard Branson was organizing a concert for February 22 in Cucuta with renowned international artists to raise money for the relief effort.